Slabsiode becomes even more dangerous after a guard is murdered and everyone is a suspect. Felicity enlists help from a surprising source in her pursuit of Diaz, and Laurel flexers her muscles as the District Attorney. Felicity's hair is looking really good these days. Has Anatoly always been referred to as the KGBeast? They really need to needlessly stop ripping off Batman history and characters. It's just not necessary at this point, as the show has its own history and mythos. Didn't Felicity have a remote thingee that she could use to hack computers and steal their data? I seem to recall her just having to get the device within the vicinity of the computer. Why couldn't she use that instead of making Anatoly stuff a really obvious flash drive into his ex-colleague's machine? They really needed to have sped through the future flashes a lot more quickly than they have. I've pretty much lost interest at this point, not that I had a lot to begin with in the first place. So who needs law school? Not Black Siren, apparently. I must admit, it has been kind of refreshing to see the characters take the same digs at her lack of education that we the viewers have been doing. At least this is some acknowledgment of how problematic this particular part of her story arc has been. That said, Oliver was a jackass to her. Doesn't he realize that as a DA she may have visitation privileges that the wife of a convict couldn't necessarily get? He was an idiot to dismiss her and her status so quickly. Well, at least being locked up hasn't changed him, or smartened up him from his idiotic ways. So Stanley has finally given Oliver a glimpse of his true colours. Again, it's about time. This is another plot that has been dragging on a bit too long. Speaking of plots that never seem to end, it's about time Diaz was taken off the board. Somehow, I doubt this is the last we'll see of him, as much as I really, really want it to be. "I am totally talking about the fact that everyone forgot my birthday last week." "Your party is next week! Act surprised!" we're not halfway through the season yet, so Diaz going away is kind of right on schedule. I'm expecting the stuff that Lyla is digging into at ARGUS to be revealed soon as the big bad. 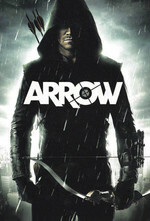 Also, it'd be great if they can show us who the new green arrow is, but I'm guessing that's on the same pace. I think Oliver was more upset at Laurel for basically helping Diaz get away, and then he came after his family. He still gives in to his emotions too easily when it comes to those he cares about. Not surprised about Stanley, but this will be interesting. I'm glad Anatoly survived. I'm guessing the writers either also like him or they know he's a fan favorite. His speech about having no regrets was intriguing, but he must have had some regret about working with Diaz when he chose to stand by his morals and helped Oliver last season. I probably haven't read Ten Nights of the Beast since the decade it came out, so I guess I can be excused for not remembering that the Beast's secret identity actually is Anatoli Knyazev. Plus Arrow's Anatoly is such a different character than the one that Starlin and Aparo introduced, so it never even occurred to me that this is who our favourite Arrowverse Russian is supposed to be. I just wish that the production team had decided to skip this big dramatic reveal. It's not needed. I second the enjoyment of Felicity's hair and the birthday party. I guess I can see now why Felicity theoretically ended up going down the evil path of The Calculator if she continues on this sort of kick. Though I still suspect Future Felicity is still alive if she's leaving William clues or whatever. Oh yeah, I still can't stand that shifty little prison weasel dude. Anatoly is still alive and I'm good with that. I don't really like any version of Laurel but that speech about not putting someone into the good or evil box ever really worked for her.